Aramith is a elven Fighter/Wizard, and possibly the tallest elf you've ever seen. He learned magic from his father, Aust, a retired adventuring wizard who now runs a small mage academy, but received his military training with the humans of Ashabenford. Though Aramith possesses the typical elf traits of grace, keen senses, and an affinity for magic and archery, he's got the charm of a dwarf and the ambitious drive of a human. He is annoyed by the elves' pontificating on the 'art' and 'beauty' of magic. Magic is a weapon, and a potent one. 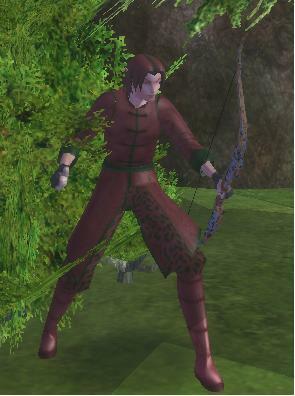 He prefers to attack with his bow, to reserve the more versatile magic for support and reconnaissance, but he knows there are times when it's best to just drop a fireball on somebody. There are nasty things out there in the world, and trophies to be brought back upon their defeat.